False teeth! Falsies, teeth in a glass, chattering teeth – these are all popular portraits of false teeth that lurk in the back of our minds. Full-mouth dentures: upper and lower teeth. Cartoons, Saturday comics, television and stand-up comedians have all helped to create this image of artificial teeth. Admittedly, these representations were once true. Dentures did not fit properly. They quickly became yellow teeth or, worse – fell out too easily. Keeping clean teeth was hard enough in the past, let alone managing clean dentures. At least, with dentures, the wearer could take them out and soak them overnight. Keeping them in place, however, was difficult and messy. Adhesives never seemed strong enough. Is it any wonder some people refused to wear them? Today, no one is longing for those good old days. In fact, today’s dentures fit better, stay snug inside the mouth and clean easily. They do not appear as phony as a two-dollar bill. Instead, they look and feel like real teeth. They actually mimic in most ways, real teeth. Two basic types of dentures exist. These are partial and complete. Both fulfill a certain role. A dentist can help in finding what matches both the need and intent. For example, a partial denture will replace a few teeth. This prosthesis is removable for teeth cleaning. It is also a less expensive alternative to a bridge or dental implant. If many teeth are missing, a complete denture is the best option. This dental appliance is removable. This facilitates the tending of teeth stains and makes teeth cleaning easier. Like partial dentures, complete or full dentures are less expensive than most cosmetic dental procedures. Overall, the choice of false teeth will depend upon whether a few or several teeth are missing. Whatever the case, the material will be consistent with the actual teeth in your mouth. In fact, replacing the lost teeth with a denture may even provide your mouth with a brighter, whiter smile. However, porcelain or composite ceramic teeth may provide you with more natural teeth than will the conventional plastic. In this instance, selecting the right teeth also depends upon the ability to pay for them. Ceramics are more expensive than plastics. This is particularly true if the approach is not conventional. It is simple to divide artificial teeth into three categories. These are conventional, immediate and cosmetic. 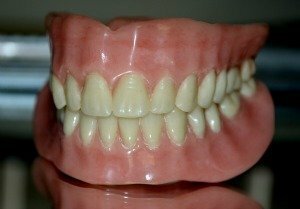 Conventional Dentures – This is the traditional process. Bones and gums heal before the dentist places them over the teeth. The product fits the first time they are put into place. This is by far the most affordable kind of dentures currently available. Immediate Dentures – once the teeth are gone, the dentist puts this type of denture into place. The immediacy will speed up the return to normal life. There is no waiting period. However, due to jaw and gum shrinkage, it will be necessary to obtain another set of dentures within approximately six months. Cosmetic Dentures – These consist of natural looking substances. Rather than plastic, ceramics are the favored material. This creates a more natural look than plastic. The procedure is more expensive because of the material and the time taken to create each tooth. Yet, what if a single tooth is broken and removed? If the basis of a tooth remains, it is also possible to turn to crowns or caps. In general, porcelain veneers teeth or ceramic teeth may be the logical choice. They appear natural and are rather durable. The fit is better than many dentures. Increased comfort is also a selling point. It may be the right alternative except for the cost. Dental procedures are more expensive than dentures. When it comes to false teeth – forget it. Select modern dentures, instead. The old is out. The new is in and it is more comfortable, realistic and better at its job than ever before. If, however, you willingly accept the expense, consider the alternatives. Bridges, partial bridges, veneers, crowns and implants may give you exactly what you want.